Recently a client sent me a link to a site and told me that what they offered sounded interesting. After visiting the site I was amazed by the promises and guarantees the sites make to get you in the first page results on Google. Some promises included “Listing in 48hrs”, “Guaranteed First Page” and “5 targeted phrases”. Now while the intentions of the Google advertising company may be innocent, the wording of the offered service led me to believe that the customer may be expecting these results to be organic (non-paid). There was no mention of “Adwords” , “PPC” or “Pay-per-click” anywhere in the text of the page (except in the meta-title and an image to say they are Adwords certified partners. To a visitor of the page this is misleading as they may think these results are obtained by some miracle work of the advertising company. They guarantee a first page listing in Google! Once again visitors may think that this is a organic listing when in fact it is a PPC Adwords listing. What gets me is that this is not rocket science, ANYONE who does a Google Adwords Campaign even if done by a none professional will get a first page result in at least 20% of the words they have targeted. GoogleAdwords actually makes it so easy to bid that you would have to be completely computer illiterate to not to get a good first page listing on some of your keywords. They claim to be live in 48hrs! This is a legitimate claim as any Adwords campaign can most definitely go live in 48hrs, however, if you are a visitor and you think this is an organic listing then you must assume that these guys are really good to get you listed on the front page of Google in 48hrs. How they bill you and where the Adwords Scam part comes into play? All guarantees at a crazy cheap monthly price! Lets say they are offering all these promises at a crazy price of R1500 (about $200). per month. Sounds like a great deal right! Adwords campaign with 5 keywords at about R0.80 ($0.11) per click , my guess is they run it on only R10 ($1.30) per day costing them only R300 ($42) per month. With this small budget they can be sure the 5 keywords you chose are front page for a good portion of the day. With a total cost to the Google advertising company being R350 ($47) where does the other R1150 ($157) go! … wow these guys are milking it with money you could be spending on a real Adwords campaign. 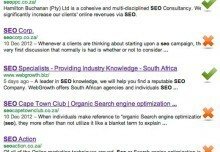 What should I be getting for my R1500 Adwords Campaign? I cannot really speak for other Google advertisers on this one but this is how I would break down the R1500 monthly budget. With this R42.50 per day we can target some 200-500 key phrases (not just 5) and get you between 30-60 clicks per day. To get more clicks we need more budget but this can all be worked out on a month to month, week to week or even day by day basis. Adwords can stop and start at any time just by a click of a button. Please note: there is usually a setup fee for Adwords charged by the manager. This is usually only a once off fee and does not apply to campaigns running after the first month. The majority of your money spend should be going to Google ad NOT your Adwords manager. Besides the setup fee which is usually bases on time spent to set up the campaign, the Adwords manager should never be getting more than 50% of your total budget. Let that money go to Google so you can get more bang for your buck. Just because they have the nice fancy “Google Adwords Certified Partner” does not give advertisers the right to charge ridiculous prices and it certainly does not give them the right to mislead you.